This is the Service Flag, now more commonly known as the Service Banner, displayed by the families of members of the U.S. armed forces in harms way. Blue stars are for family members on active duty "in harm's way", gold stars are for family members who died in service. I felt pretty ignorant not to know that. No links on this topic because finding an authoritative reference will take some time. 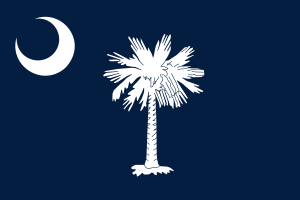 This one is the flag of South Carolina. There are many variants. **update 2/22/2010 the rock is gone. Bye-bye, rock! Here are exclusive pics of the BIG ROCK that appeared last week when an old apartment building at approximately 980 Maiden Lane was demolished, rubble removed, and the lot graded. The pictures were taken with an old Olympus D380 digital camera that I picked up at the Kiwanis Sale for $5 this morning along with some Mozart string duos and some Purcell Fantasias for Viols. In this shot my tracfone is resting on the rock for scale. That sucker must be close to 7 feet high!! Of course Deb wants it in our front yard. If it is there long enough next week I'll scrub off part of it to see if I can tell if it is igneous, sedimentary, or metaphoric. My guess is that it is a Canadian glacial erratic, granite or something similar. As musical accompaniment as one regards the BIG ROCK here is the "Fantasia upon One Note, 5 Voices, in F Major" of Henry Purcell. This comes from the LP MHS 1767, Henry Purcell: The Fantasias for Viols. The performers are the Concentus Musicus, directed by Nikolaus Harnoncourt. Denis Stevens tells us in the liner notes that the piece is "so called because the middle part sustains the note known as middle C throughout the composition". Think of the middle C as a BIG ROCK. To go with the music and the pictures enjoy a Bell's Hopslam, a very strong seasonal brew with a prominent grapefruit-like tang. This stuff is expensive but you can pick up a single bottle at Arbor Farms Market for $3.25 or so. It's worth a try. I wouldn't serve it real cold, it's got a lot of flavor. The glass, by the way, is a souvenir from a local venue where the big band had a long presence.